The Ontario Lottery and Gaming Corporation (OLG) is going court side with its new campaign. 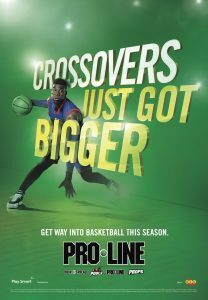 The OLG has added basketball wagering to its Pro-line sports platform and is promoting the addition with a new basketball-themed campaign. Created by The Hive, the campaign launched last week in unison with the Toronto Raptors home opener against the Washington Wizards. The campaign is anchored by a 30-second spot that shows a series of basketball fans decked out in Raptors’ red and black, cheering with their lottery tickets in hand. Pulling from basketball culture, the fans in the ad make what The Hive managing director Trent Fulton calls the “hold me back” motion—excitedly throwing an arm over a friend’s chest, just like court side players during big game moments. The spot was filmed in part at Real Sports, the sports bar inside the Raptors’ home arena, the Air Canada Centre. It also features other nods to the local fandom, like the Peace Collective’s popular “Home Is Toronto” t-shirt. This fall marks the first time consumers in Ontario can legally wager on basketball games since the Toronto Raptors were established in 1993. At the time, Pro-line included basketball in its offering, but the NBA struck a deal with the Ontario government preventing wagering. The league has since loosened its rules, allowing the OLG to bring basketball back to Pro-line. According to the OLG’s vice-president of marketing, Wendy Montgomery, the consumer demand for basketball on Pro-line has grown greatly as basketball’s popularity has exploded in Toronto. In addition to the 30-second ad, the campaign includes print, OOH and a 15-second version of the ad that will run on pre-roll. The campaign will be in heavy rotation on broadcast throughout November before moving to digital and social later in the basketball season. PHD handled the media buy. The spot is currently airing on both Sportsnet and conventional television. The agency purchased out-of-home space between the Air Canada Centre and the closest transit station, Union Station. The OOH is also running in transit shelters and on Go Trains. The Hive recently defended its OLG account in a review that started in January. In August, the company re-awarded the agency the account, in addition to two new assignments for its communications around OLG gifting and OLG winners.